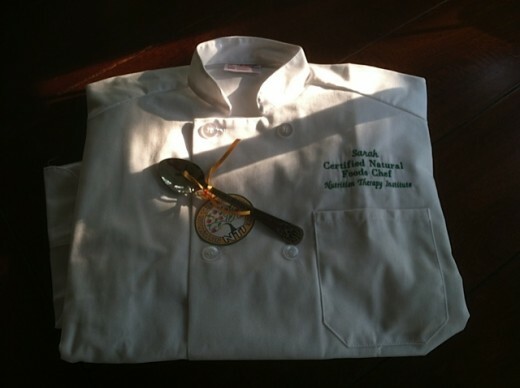 I became certified as a Natural Foods Chef at the Nutrition Therapy Institute in Denver, Colorado. I did it to enhance my own food journey, as I’ve made some big changes in my diet over the past eighteen months. I also knew it would enrich my services to the food-industry customers of my marketing business. It was an intensive program with studies in both nutrition science and culinary art. The core of the curriculum taught us the nutritional needs that are common to specific health conditions, and then we learned to develop and analyze recipes, plan menus, and prepare delicious foods that support healing from those conditions. While the journey of culinary arts is an unending one, this program gave me an excellent foundation and methodology for research and design of meals and menus that support the body in prevention and healing. Once a person has a diagnosis and recommendations from his or her doctor or nutrition therapist, I can turn those recommendations into a very satisfying way of eating – and cooking, if lessons are in order. The nutrition education I received was not your standard American Dietetic Association fare, and it was no surprise to learn that nutrition science has been dominated by big business in the same way that most food production has been. Keeping current on latest research will be a challenge for all of us, and I’m glad to have some new tools and resources to help me do so. Just don’t get me started on saturated fats! Needless to say, this experience filled my head with all kinds of ideas about how to share the things I learned, so I’ve decided to offer some food-specific consulting as a sideline to my marketing business. I call it Whereabouts Kitchen, and the services I offer include recipe and menu development, product demos, cooking classes, and editorial content about cooking for health. Now back in Wisconsin, where healthy restaurant options are limited, I’m all the more grateful for my added culinary skills and inspiration. The herbs in the garden are booming, the local produce selection at the Viroqua Food Co-op is fantastic, and the season of potluck picnics is upon us!